Irena Grugulis, Professor of Employment Studies at Bradford University in the United Kingdom, complains that an ethics committee imposed medical standards on her organizational research. My own work is probably about the least harmful you can imagine. I spent last year conducting an ethnography of a computer games company, watching the way people learned skills and the way they were managed. No under-18s, no members of vulnerable groups, no illegal activities. Everyone was told who I was in advance by the company, both company and individuals would be anonymised in any publications and before observing anyone I would ask their permission. So far so unexceptional, and the only problem I anticipated was whether informants would be happy to accept Krispy Kreme doughnuts in exchange for being mithered at work. Enter the ethics committee. They insisted on full written consent from every worker in the offices (about 250), every delivery person and – on the occasions I went off for a chat with informants – every barrista who served us coffee and waitress who brought us pizzas (no, seriously). An extensive correspondence later, since that would have effectively made an ethnography impossible, they grudgingly agreed to let me proceed and turned their attention to other social science projects. They queried the relevance of research into trade unions and advised that researcher to take steps to ensure their personal safety (because union members are sooooo dangerous), issued formal guidance that interviews over 30 minutes required special permission from the committee and, in the famed Battle of PostModernist Hill, decided that auto-ethnography should be barred. 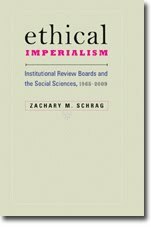 As Grugulis notes, such restrictions violated the guidelines of both the British Sociological Association and the Economic and Social Research Council. This shows that even in countries such as Canada and the United Kingdom, where social scientists have worked out ethics guidelines nominally more pluralist than the Belmont Report, ethics committees continue to impose medical rules on non-medical fields.